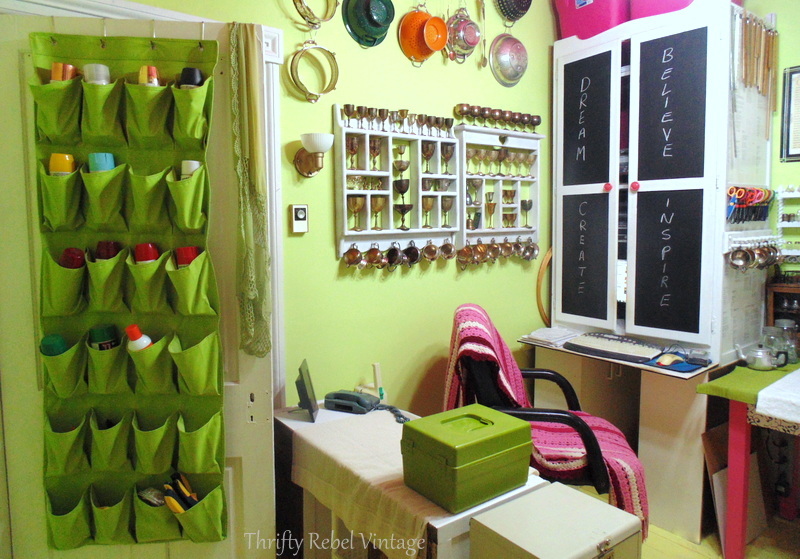 I’m so excited to finally share my finished craft room organization project. YAY!! After two months of purging, reorganizing, and rewiring my brain it’s finally done, and I couldn’t be happier with it. 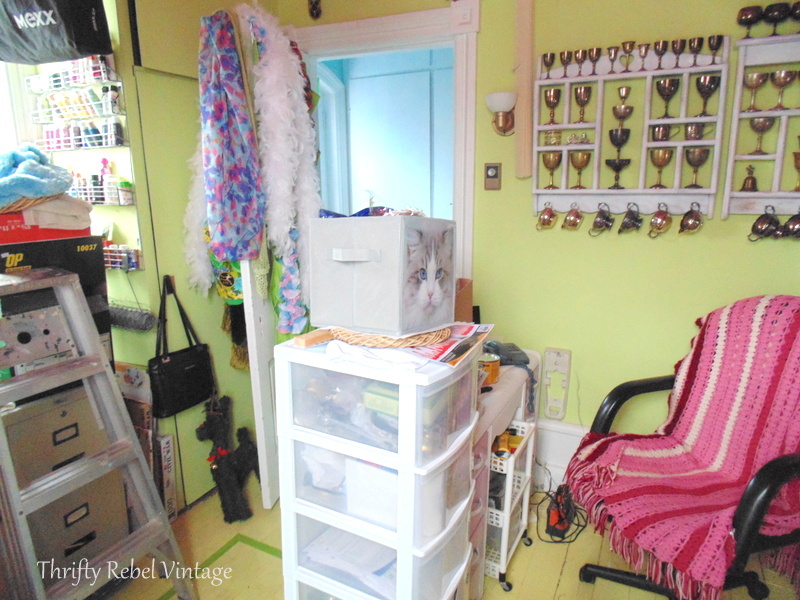 I’ve customized this room to help me to do what I love to do… repurpose, reuse, and upcycle with thrifted finds and vintage treasures. Hopefully you can take away some ideas that will work for your creative space. So let’s get on with the tour. Here’s the before of my desk area. What a mess! I absolutely hate having stuff all over my craft room floor. It’s one of my pet peeves, but even so there you see there’s stuff all over the floor. My pringles can wine rack storage holds all the silverware and other such items that I use when making wind chimes, and the enamel bowl tiered stand holds bits of lace and trim. The repurposed ceiling tile wall storage keeps a lot of little things that I use regularly handy, and my hanging wooden shoes hold my pens, sharpies, scissors and screwdriver. I bought a bunch of pink bins on sale from the local Home Hardware and put two on top of my computer armoire. One holds shredded paper for packaging, and the other holds odd and ends of bubble wrap, tissue papers etc. The two mason jars hold chandelier crystals in two different sizes, and the cute little aluminum teapot hold the smallest of the chandy crystals. I use one chandy crystal in every wind chime I make. The easy craft scissors storage keeps them all organized and handy. The two little shelves hold my mini salt & pepper sets. They make me happy so I like to keep them around, plus some day some of them may be used for a project. The bottom shelf unit is waiting until warm weather comes to get its makeover. It’s too cold outside right now, and spray painting inside is a big no no. At least for me. I hated that plastic bin, and one of the drawers has been broken for a long time. The plastic bin is gone, but the four good drawers went into the newly organized closet. 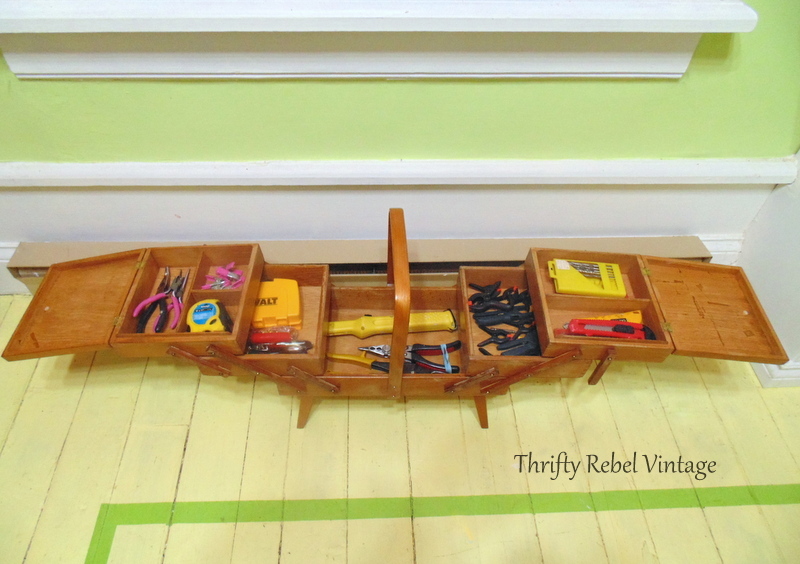 The green vintage plastic box holds my drill and some vintage screwdrivers. I keep a lot of different things that I’m collecting for future projects in the drawers of my pretty in pink dresser, and I’ve had the metal filing cabinet for years and it holds a lot of project paperwork. This room has a 9 1/2 ft ceiling so I took advantage of that by adding an eight foot length of 1×3 near the top of the wall for storage. 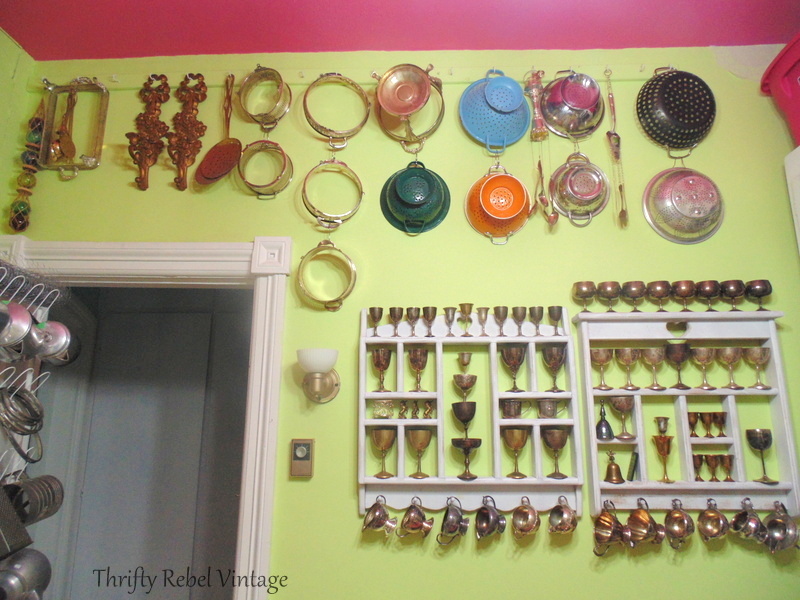 I painted it the same colour as the wall, added some dollar store metal hooks, hung my treasures and voila… instant storage where empty wall space used to be. I used those simple metal clasp type shower curtain rings to join things to use more of the available wall space. You’ll see in a later pic that I did the same thing to the other side of the wall. One of these days I’ll start using my vintage goblet collection in projects, but for now I still just like looking at them. They make me happy, and I love the way they look displayed all together. A few years ago I found this white metal shoe rack for $1. It’s been hanging around in my storage greenhouse since then waiting to be used for something. It’s the perfect size so I simply screwed it to the door, added teapots, coffee pots, sifters, shredders etc. They’ll now wait here to be used for projects rather than in boxes in my greenhouse. I like seeing them every day, and someday inspiration might just strike. Oh who am I kidding? lol. Since everything pretty much looks like a potential wind chime to me, most of these will probably be wind chimes some day. I moved this fabric shoe organizer to the back of the door. It will continue to hold spray paint, some painting supplies, and a few large clamps. I need to restock my spray paint supply when warm weather comes. To me this is the worst one yet. Stuff everywhere. The two filing cabinets will get a makeover someday. One hold regular bills, and the other holds decorative papers, sheet music, map books etc. The large glass jars hold most of my vintage cookie cutter collection, and the hat box holds my pared down scarf collection. I added a shelf over this window to take advantage of the ceiling height again, along with the shower curtain rod. 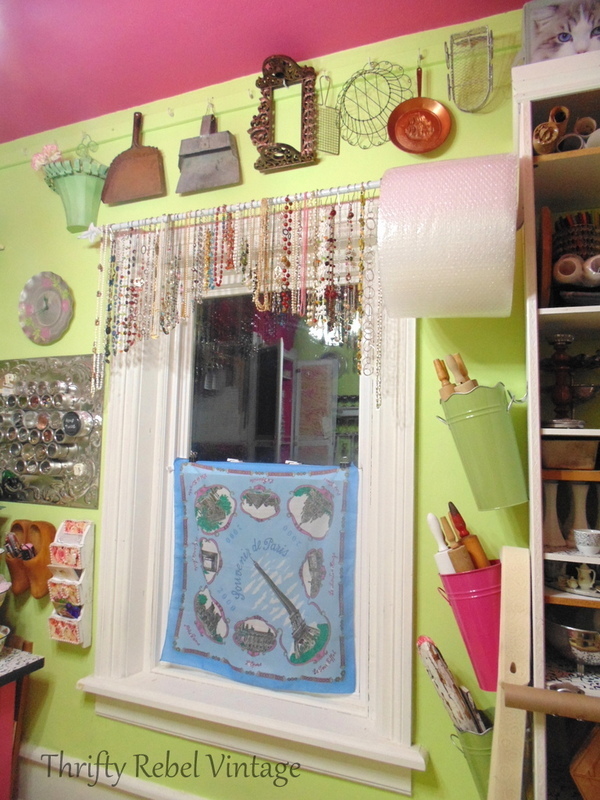 I screwed in some dollar store metal hooks here too and I’ll hang finished wind chimes and items waiting to be used in projects. The three pink bins hold vintage Christmas treasures… some for me to keep, and some will eventually go to my etsy shop…. maybe. lol. The decorative cardboard boxes on top of my built in bookcase hold things for Christmas projects. Polly the brass parrot has found a good home with the silver tray window valance. My necklace window valance stores most of my necklaces that are waiting to be used in projects. They are so easy to remove and add as I like. A 12″ shelf bracket high up on the side of my bookcase holds a bubble wrap roll. It doesn’t take up much needed space like it used to and it’s easy to pull and cut when I need to pack something. It was John’s idea to store my craft paper, also for packaging, along the front of my bookcase. I used two dollar store tool hanger brackets, and now it’s so handy. It’s placed perfectly in line with a shelf so it doesn’t get in the way at all. Here’s the ceiling storage on the other side of the room that I mentioned. The Paris souvenir scarf curtain is held in place with binder clips so it’s easily removed during the day. I like having it there at night for privacy. Here’s the last before… of my bookcase. This pic must have been taken on another day because the mess looks a little different than the other photo. A little worse actually. Much more neat and organized. 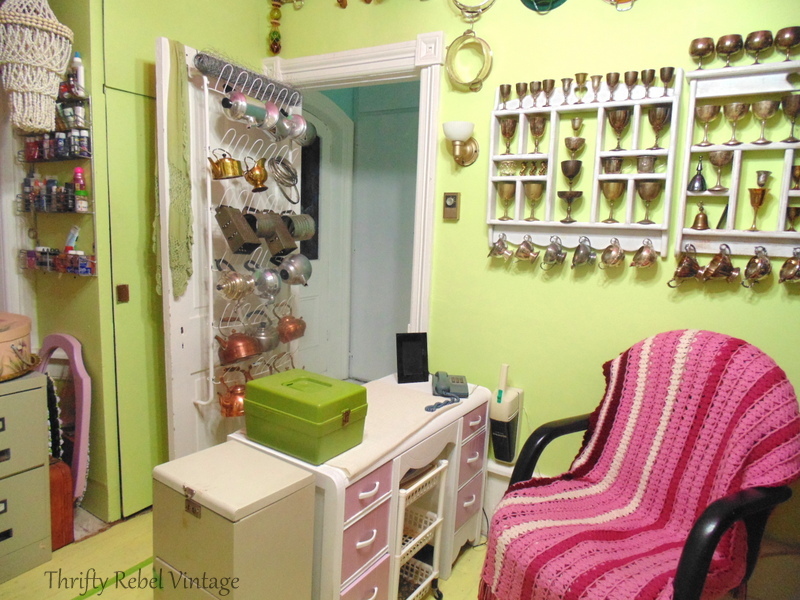 The large green vintage pot holds my collection of vintage sets of measuring cups and measuring spoons. The vintage accordion bead keeper holds vintage jewelry bits and pieces. The two vintage bread boxes hold bits and pieces of fabrics and laces. 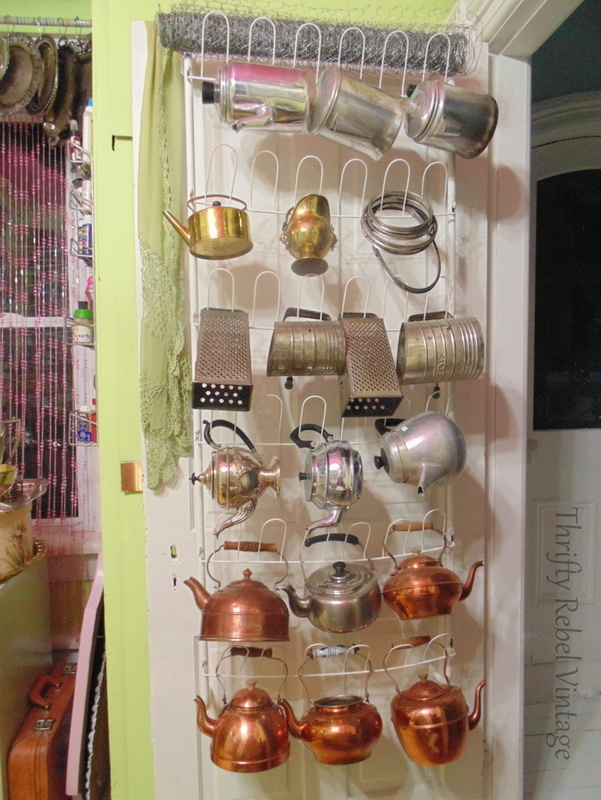 This bookcase will be an organizational work in progress as I collect more vintage bakeware to organize my things. Different sizes of bakeware can be stacked to maximize storage. I absolutely love my vintage accordion sewing box which is now being repurposed as a tool caddy for the tools that I use on a regular basis. It sits in front of the window beside my desk. It needs space to stretch out when being opened. I have to say that I’m so glad my craft room is finally done. It was a really big job. Much, much bigger than I thought it was going to be… especially the purging. I think I must have taken 6 or 7 boxes and 4 or 5 bags of stuff out of this room and donated it. The more I purged the easier it got and the more I wanted to purge. 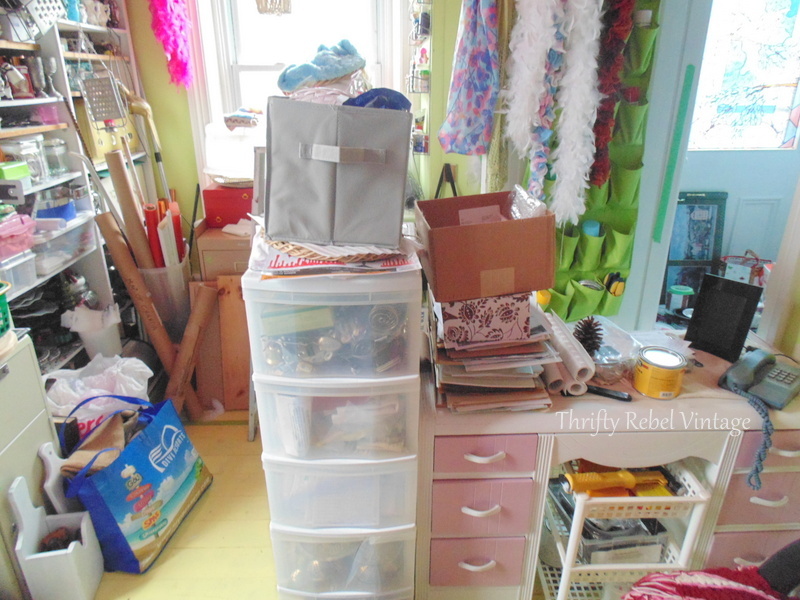 Getting started with the craft room purging was the hard part, but once I got going… I was a purging machine. If I didn’t absolutely love it, really need it, or haven’t used it in the past two years it was gone, gone, gone. I got rid of a lot of old cardboard, plastic, and glass containers that I used to use for storage… but I also got rid of things that I haven’t used in years or that I had forgotten I even had. If I had forgot about them how much did I really love them? I also went through my etsy inventory and donated a few things that have been hanging around far too long. 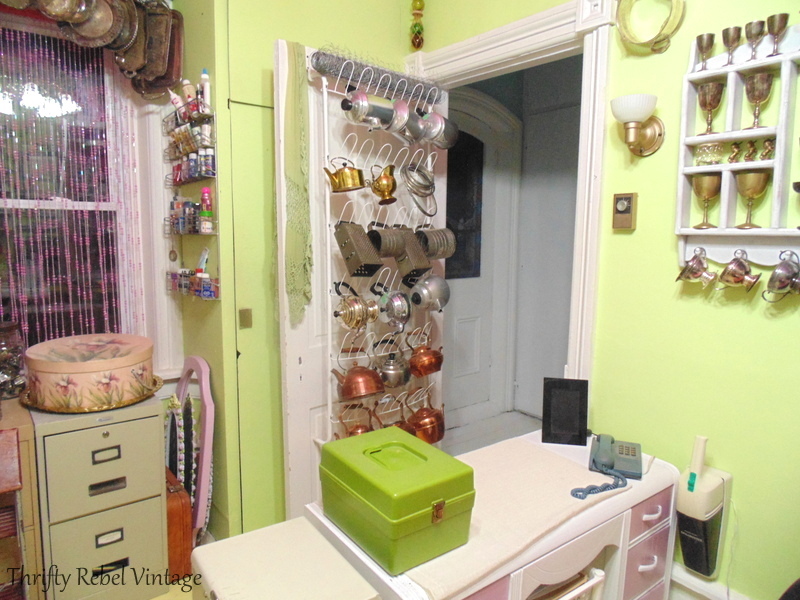 The rest are now stored in the cupboard across from the door to this room in the hallway, along with crafting items like wreath forms etc. Doing all this purging made space for other things that I love to come back into this room where I can see them, enjoy them, and use them in future projects. Getting my craft room reorganized has been a rather long and sometimes seemingly never ending process, but it has been so worth it. I had a lot of classic rock music nights where I purged and organized while rocking out. Thanks goodness for Sirius XM’s Classic Vinyl and Classic Rewind music stations. For me music always makes the most boring and tedious jobs fun. Now this is what I see when I first walk into this room, and it makes me feel so good. I can’t even really explain how happy it makes me. I love that the floor space is so empty and open, except for a few items that stay there all the time. The room feels so much larger now than its actual 8 x 11 feet, and I think I’ve pretty much maximized every inch that I can. My goal for my craft room organization was to make it practical and functional first, and pretty second… and I think I’ve succeeded on both fronts… at least for my needs and purposes. I’ve said it before and I’ll say it again… and probably will say it again, and again, lol, to me organization is a beautiful thing. Thanks so much for reading, and until next time… keep on keepin’ on. Awesome! Really looks great; everything so nicely organized and most everything within your reach or easy to get to. Well planned out in organizing in small space. Thanks Colleen! Mine were collecting dust too until I got them out. Now that I see them hopefully I’ll do something with them someday. 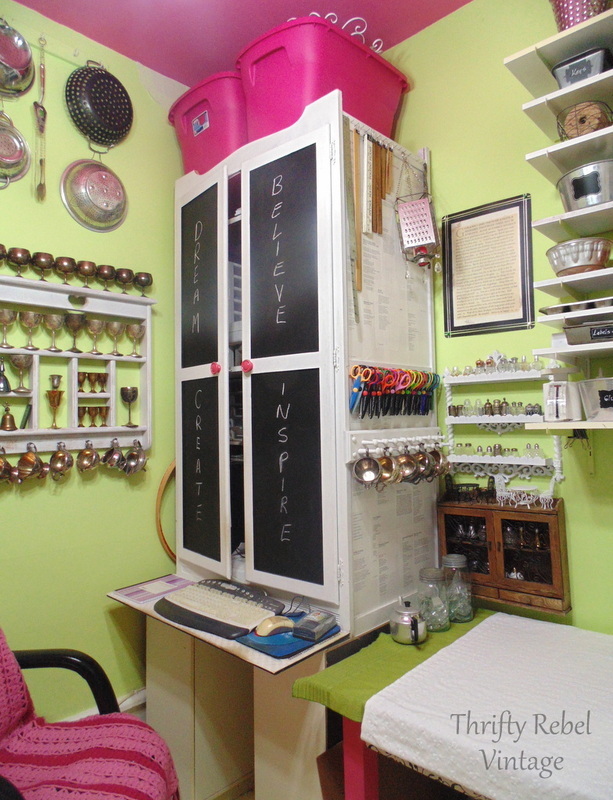 Your craft room looks fantastic, Tuula! Great job and organizational skills! I can only dream! Thanks Gail! I am so thrilled that it’s done. Now I can finally start on other things. Thanks Dona! This room makes me so happy. It’s the one little piece of the world that’s all mine. I can see how audio books would work too. Anything that makes tedious work enjoyable is a wonderful. Oh Tuula–I LOVE IT!! I love all the nifty storage, for sure. Thanks Kirby! I’m ecstatic to have it finally done. Way to utilize ALL the space, girlfriend. It must feel good to be that organized. 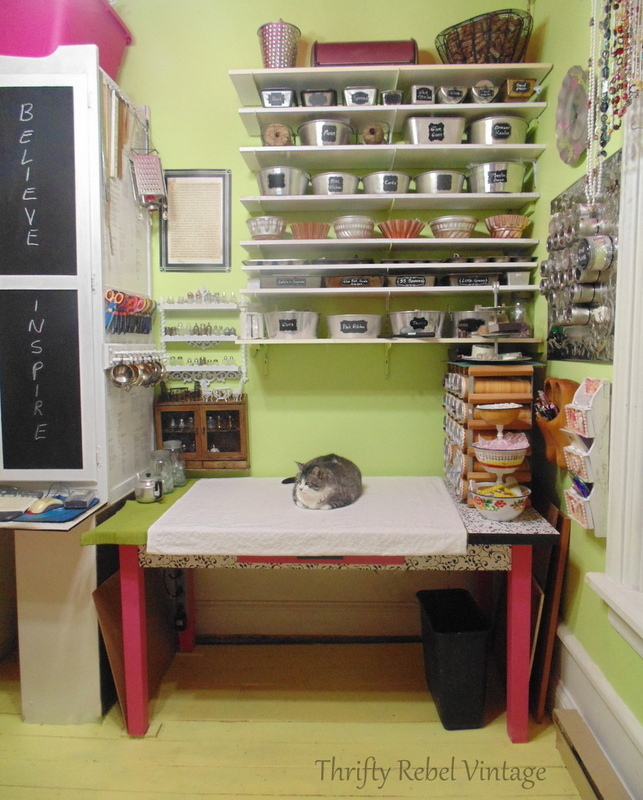 Hi Tuula, Your craft room looks wonderful and clearly arranged. You found so many great storage solution for your treasures. It’s so much easier to work when things are visible and not hidden in drawers. Have fun creating in your “new” space! Your kitty is adorable!!! What’s her/his name? Thanks Julia! I agree about having things out where they can be seen. If I put things away I tend to forget about them. I find the chalkboard labels are really helping for the things I want hidden but still easily reachable. I can’t believe I forgot to mention Monkey in the post. We nicknamed her Monkey because when we took her in as a young stray she was always looking for mischief and got into absolutely everything. She grew out of that and is a real sweetheart now, but the name stuck. Thanks Sharon! That’s one of my hobbies/problems… I love to thrift shop too. I’m teaching myself to be more picky about what I bring home because I only have so much room. I do collect a few things, always with the intention of using them in projects someday. That just doesn’t always happy, but I can enjoy than while they wait. Wow, I am so impressed! You have utilized every possible bit of storage and it looks great. Love your collections and they way you’ve stored them. Thanks so much Cecilia! It’s fun to have my collections out where I can see them and enjoy them. Many of them will probably be used in projects at some point, but I can enjoy them in the meantime. Wow! 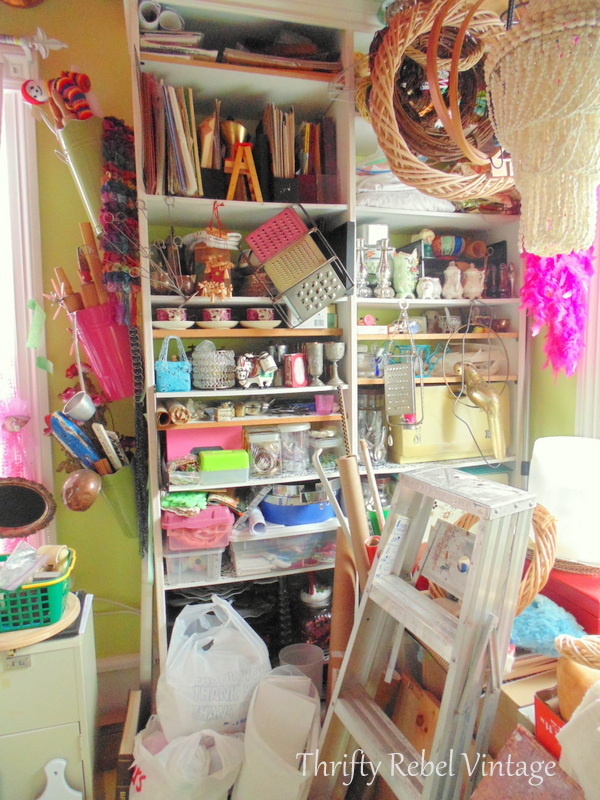 I can’t believe all the stuff you managed to artfully organize into your space, it looks great! I just posted the first post for my studio redo, hope you’ll check it out! Thanks Tania! I did try to use all the bit of space that I could. It’s a small room so I had not choice but to find creative storage solutions. Hey Tuula, I bet my “befores” are worse than yours…lol I’m in the process of redoing my craftroom. I filled an entire garbage can and recycle bin. These are the large stand-up, picked up by sanitation, type of bins. I also, so far, have filled six 18-gallon totes that I will be donating back to the thrift stores. I still have more to do. I’m thinking of putting shelves in the closet to hold all the “backup”, stock on hand, items. Wish me luck!! I need to get some photos before I finish this off….. in the next year! lol Thanks for the inspiration! You are an inspiration for me…with your before photos and afters! I need to really get busy, I purged a lot of craft stuff last year and sold in “the longest yard sale” that runs through our local area and everything got snatched up and was a big hit, but I can do more and then I need to really organize! My area is in the basement and I am tired of everything being down there, I need to move it back to the main floor of our house. So wish me luck with this project for 2016! What a wonderful room, I’m inspired just looking at it. I know it feels so good!!!! You did such a great job with all the pieces and bits and bobs that you have. I’ll keep plugging along with all this inspiration! Thanks Tina! Keep going… even when it feels like you’ll never be finished. It’s so worth all the effort. It all looks wonderful! You deserve an award for perseverance along with the top honors for organizational ideas!! How can it get messed up? There is a place for everything! Thanks AnnMarie! There were days when I just wanted to give up on it, but thankfully that feeling was always temporary. But I’ve never been so glad to have a makeover done in my life. lol. WOW for all your effort, but biggest gasp goes to the amazing silver platter and necklace valances! The swag angles are the perfect touch. Thank you so much! I do love my window valances. They’re a little out there, but sometimes I am too. lol. Thank so much Lottie! I certainly will have more time for crafting now that this room is done. It’s been my major focus from the New Year on. I’m so happy that you’re enjoying my blog, and thanks so much for following. Thank you for sharing with Roses of Inspiration. Hugs! Thanks so much Stephanie! I’m so pleased that this room is finally on the done list. It was a big job and I’m very happy with it, but it’ll be nice to be able to move on to other projects now. Well done! It looks like a great creative space! Thanks Zefi! I’m so happy to have an organized space again. It’s so much nicer to work in. 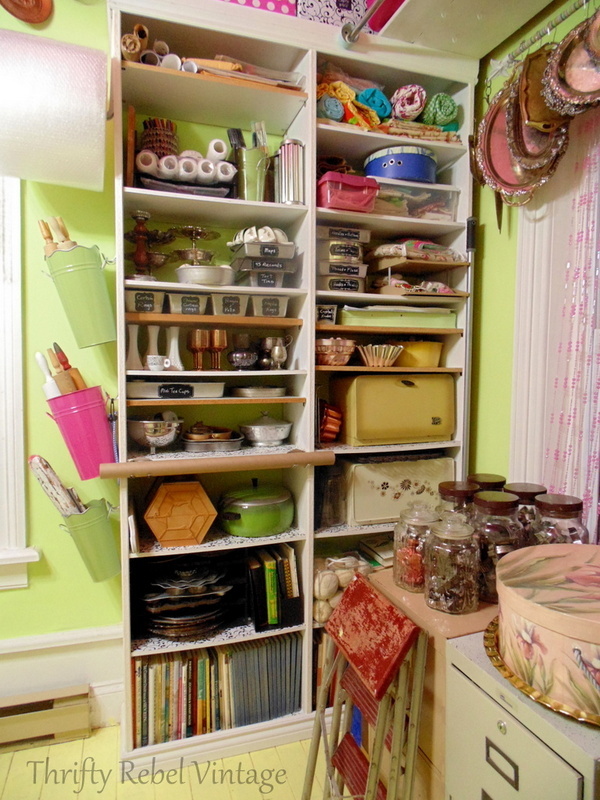 You have outdone yourself from the pink ceiling to the countless upcycled storage ideas. The shoe rack is my all time fave, but truly, they are all magnificent and so unique. LOVE!! 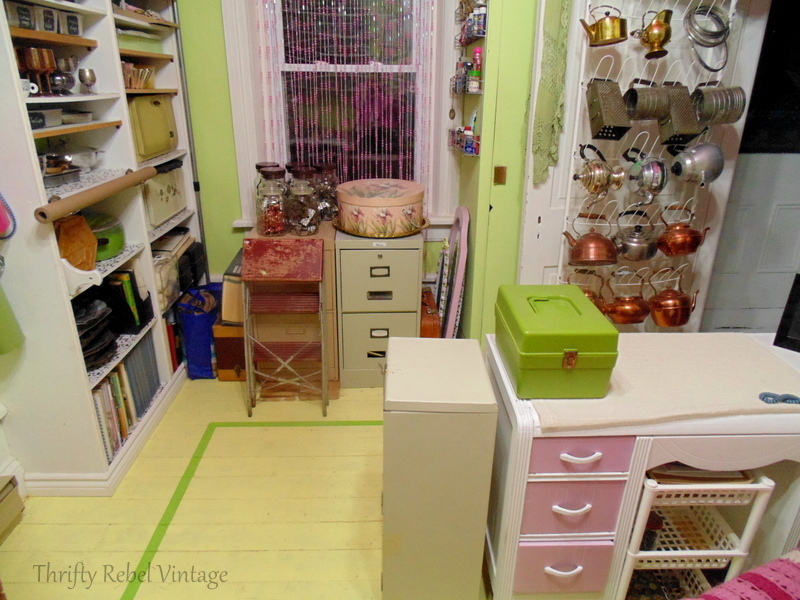 I LOVE what you’ve done to every inch of your craft room. 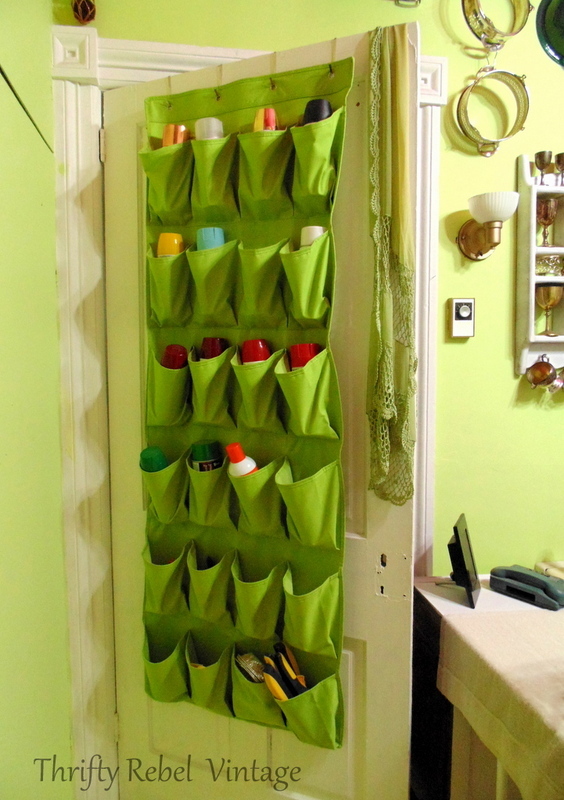 You have a real talent for organizing and making your supplies look good at the same time. Very creative and inspiring. I also noticed the arched door in your hallway…wow, it’s a beauty! Thanks for sharing your new space at Talk of the Town. Thanks so much Betsy! I actually really love organizing things. That must be why I mess things up, just so I can organize them again. lol. I hope this time that I’ll stop that trend. I have other areas of the house that I can mess up instead. lol. Great job getting it all organized, what a fun space to create in! Thanks for linking up to Talk of the Town Link Party. Thanks so much Becky! I’m very lucky to have a room all to myself to create in. Such a bright, creative, organized space! 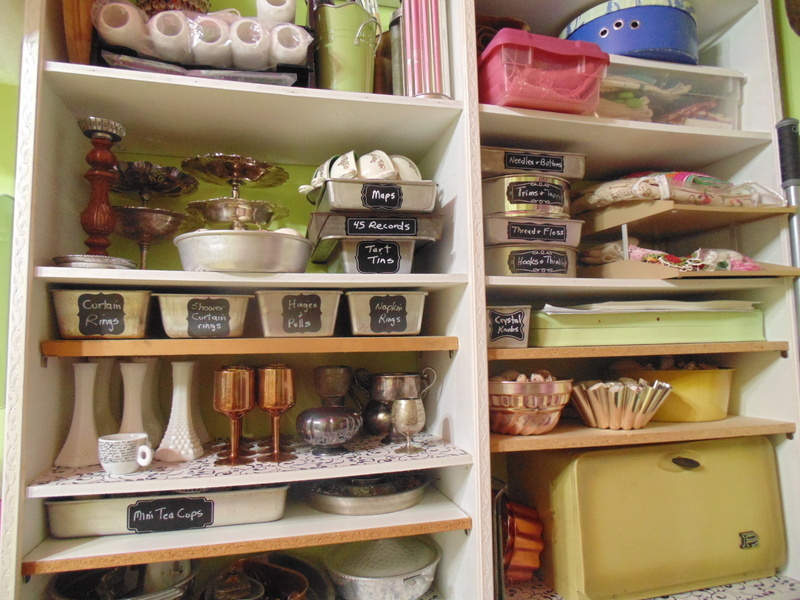 My favorite remains the bakeware organizers with chalkboard labels. A close second is the shoe rack turned hanging rack – so clever. Also I love the silver tray valance. And the FLOOR! You can see your floor – something I can only aspire to ! Thanks Donna! Yes I can see my floor, and it’s wonderful. There was a time when I wondered if I would ever see it again. lol. I have vowed to keep my it clear of junk from now on. It’s amazing how much bigger the room feel just be getting stuff off the floor. 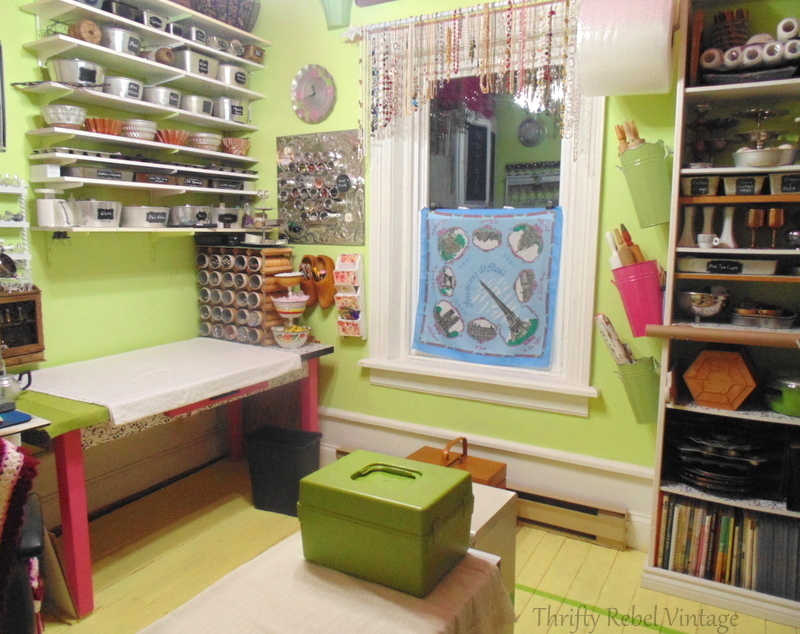 Wow, I just love your craft room. You have definitely inspired me. 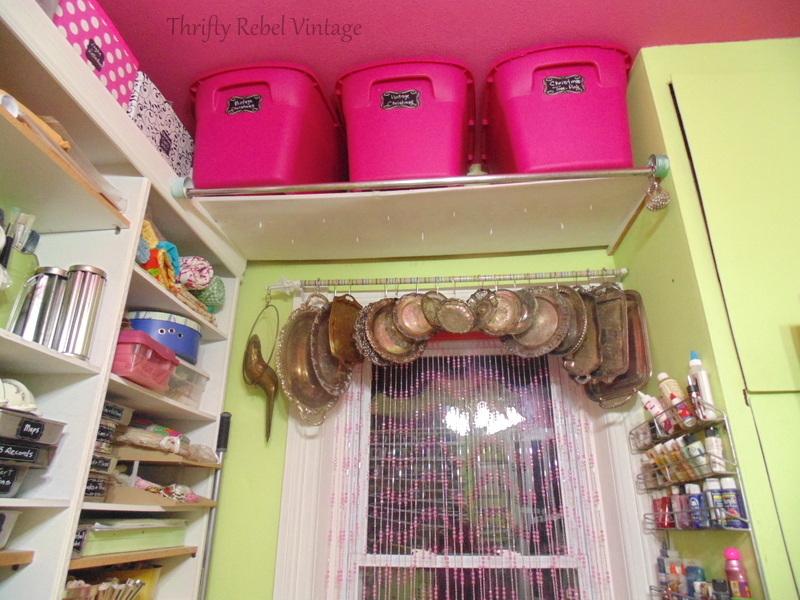 I love how you have used vintage tins and pots for storage, what a great idea. It makes me want to go shopping for some LOL. You have definitely used your space well, with extending up to the ceiling, etc. Enjoy spending time in your craft room. I LOVE YOUR PINK CEILING!!! You really are on clever cookie! That rack on the door is genius. You definitely have inspired me. 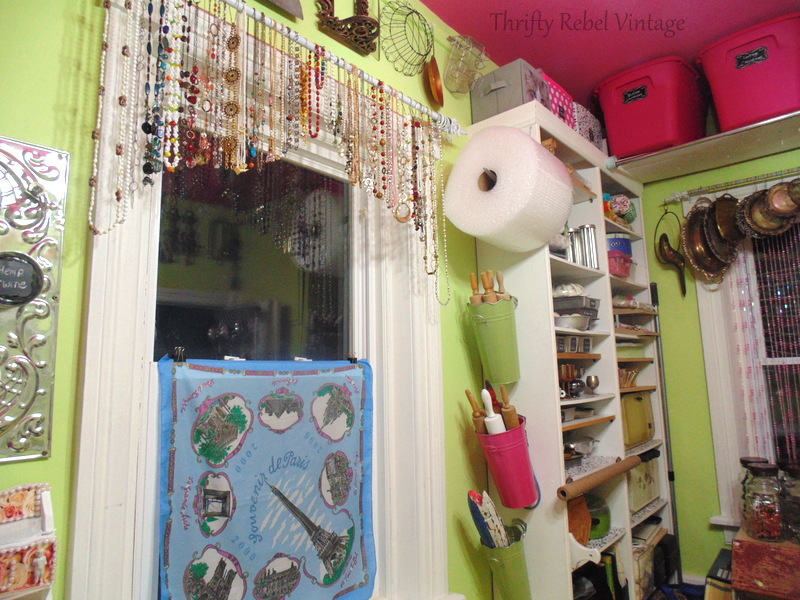 Love your tray valance, your paper hanger…..i just love it all. Thanks so much Karen! It’s feeling really good to be organized. I have to say that I love my pink ceiling too. It makes me so happy! 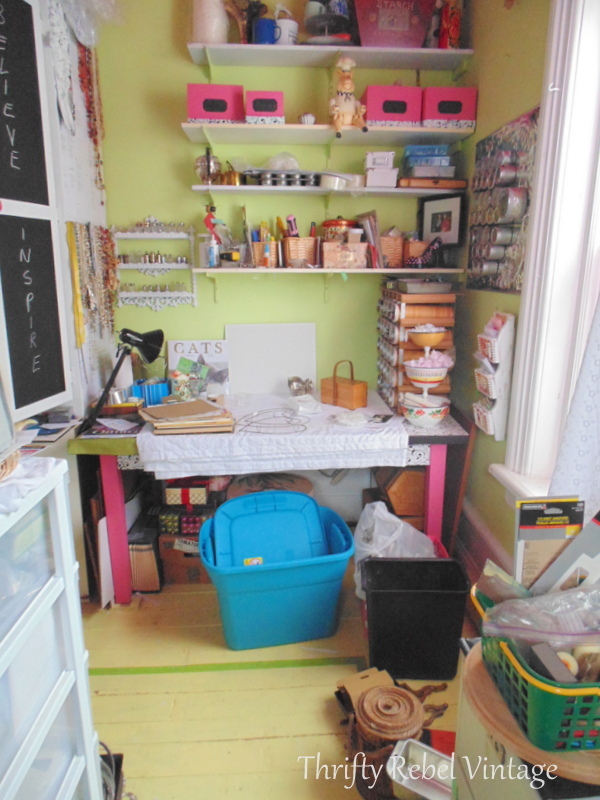 Your craft room looks great! It’s nice you have everything in it’s place, and very place has something. Haha. Seriously, I love that you have project items as part of your decor. Love it! Awesome! Love it.. some very clever ideas! Can’t wait to see what you’ll be inspired to create in there. Enjoy your weekend! Unbelievably awesome!!!! I am totally inspired. This is one of the best organizing makeovers I’ve ever seen. I love how you’ve got all your collections out so you can see them but organized so you can enjoy and use them. It’s incredible how much you’ve got tidied away in such a small space. And the pink ceiling is just flat out fun. Great job!!!!! Thank you so much Lori! I’m so lucky to have my own space where I can display and use the things that inspire me. I painted my ceiling hot pink a few years ago and it’s still one of my favourite things. 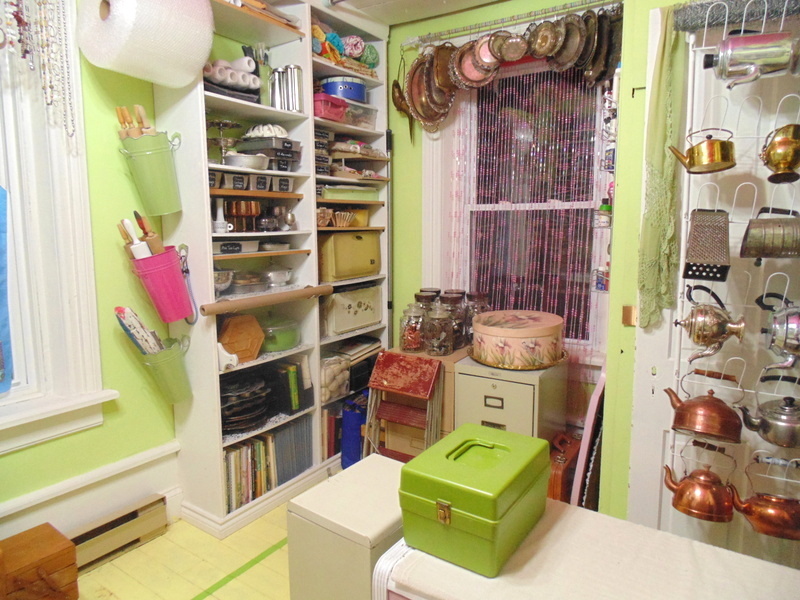 I love your craft room – it has everything!! Thanks very much Kim. I’m enjoying working in a much more fun and organized space than what it used to be. Thanks very much Carie! I appreciate you stopping by for a visit. I’m happy to say that I’m still enjoying my craft room.